Modular construction, using timber as a key element, is a credible solution to fast and sustainable housebuilding. However, in the latest issue of ABC&D magazine, Metså Wood believes that more needs to be done in terms of sharing knowledge and innovation in wood construction to further advance the use of this material in mainstream construction. Metså Wood looks at further advancing the use of wood in mainstream construction with the sharing of knowledge and innovation. In order to help facilitate this process, Metsä Wood has launched its Open Source Wood initiative at www.opensourcewood.com. 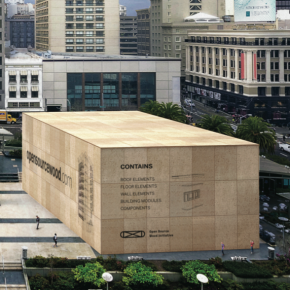 The initiative is a call to action to architects, designers and engineers to join forces, share innovation and contribute knowledge about large-scale, modular wood construction. By creating an open innovation platform around modular wood construction, Metsä Wood’s aim is to connect the local wood construction industry with global knowledge to facilitate collaboration and growth. Today the construction industry is dominated by two materials – steel and concrete. Only a fraction (5-10%) of global urban construction is wood, due, in part, to the fact that the industry is fragmented and local. Wood, however, is an optimal material for urban construction as it enables faster building processes; its lightness leads to more affordable structures and it is the most environmentally friendly building material, battling climate change through carbon storage. The initiative takes its inspiration from open source ideology, championed by the software industry, to drive innovation further and faster, and to increase speed to market. Metsä Wood is taking the first step by sharing its own intellectual property for modular Kerto LVL wood elements, making them freely available for everyone. As industry support for a shared approach gathers momentum, the potential of wood is undeniable and, today, offsite construction has major aspirations. Prefabricated wood elements enable fast, efficient and environmentally sound design without reducing quality. Reports on the benefits of such a lean approach are compelling: In a study of companies that have applied lean construction methods, 84% report higher quality in construction and 80% experienced greater customer satisfaction. Development in the housebuilding sector is key, and offsite timber construction could be key in achieving the high volume of housing required in the UK. Using new andforward-thinking products, homes constructed offsite can be turned around in a matter of weeks. Modern engineered wood products can be used for a variety of housing projects ranging from terraced and detached homes through to apartment blocks several stories high. Across Europe, timber prefab construction is already mainstream, yet here in the UK we seem to be slow on the uptake. However, the tide is slowly turning with a greater need to provide affordable, adaptable and ecological homes. Despite signs of progress, more needs to be done to help housebuilders, developers and planners better realise the potential that modern wood products can offer. It is hoped that the Open Source Wood project will help to highlight some of the innovative projects taking place across the globe and, through a collaborative approach, bring timber construction methods to the forefront of new housebuilding in the UK.